Unbeaten Brook, who recently signed with Matchroom Promotions and is now looking to kick start his promising career, after frustrating absences in between contests and fights in the Steel City for the first time in five years. Brook has recently been thrust back into the boxing limelight, with TV appearances and Sky TV commentary and admits that signing with the Eddie Hearn run boxing team, has given his career the boost it needed. The Welterweight star and many peoples tip for a world title, admitted there will be some nerves when he tackles the experienced 39 year-old N’dou, who has yet to be stopped in 62 pro fights, but will look to live up to the hype in front of his home crowd and a very special ringside observer. “I’m a professional so I hope I’ll be calm and do the job in a professional manner,” said Brook. “But with a sell-out crowd in to see me, with all my family there, it’s going to be so a great occasion. “My Granddad is going to be coming which I’m so happy about. He’s getting on a bit now so he doesn’t like to travel too much, but he’ll be ringside and he’s a Sheffield man who’s loved his boxing forever, all the British greats like Henry Cooper and John Conteh, so for him to be there is something very special. Brook – whose new official website www.kellbrook.co.uk is now live – says he knows N’dou will provide him with the toughest test of his career so far, but he feels he’s ready to impress with a move to new promoters giving him a real boost. The Sheffield show makes it back-to-back sell outs for Matchroom Boxing after the Prizefighter Welterweights II event at York Hall in east London was a full-house hit. “Since joining Matchroom everything has changed,” said Brook. 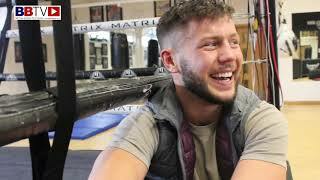 “The relationship I’ve got with Eddie Hearn and with Sky Sports is amazing, and I’ve been everywhere, interviews on Ringside, commentating on Prizefighter – I couldn’t wish for anything better and I’m in a really good place now.